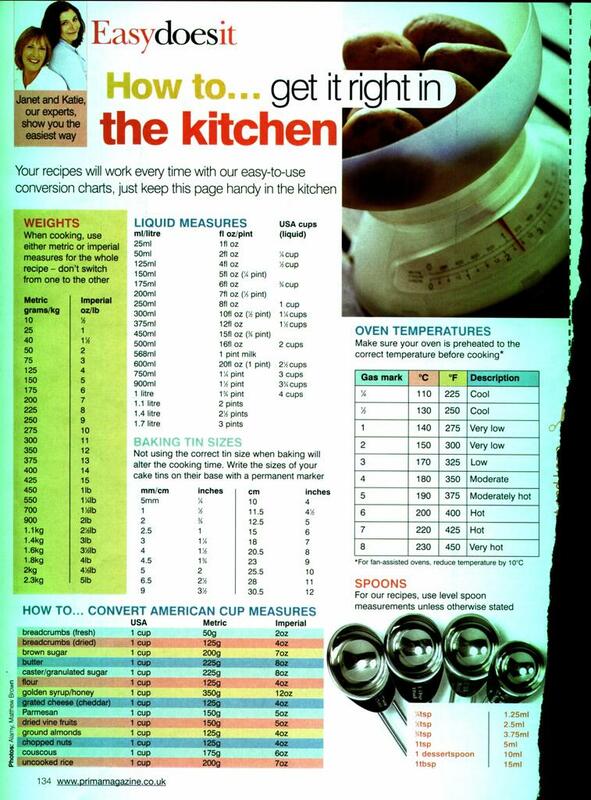 For gigi-hawaii a table of conversion measures, I posted this years ago when I began sharing recipes, but I don’t think I knew you back then. 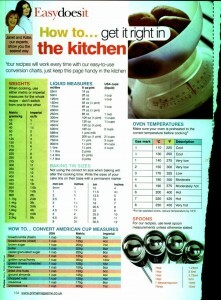 It is a page from an old magazine from way back, but useful to have. If you wish to save it, you can right click and then copy and paste to your own folder. I hope it helps. This entry was posted in recipes on May 6, 2013 by Grannymar. Put the lemon zest and juice, the sugar and the butter, cut into cubes, into a heatproof bowl set over a pan of simmering water, making sure that the bottom of the basin doesn’t touch the water. Stir with a whisk from time to time until the butter has melted. Add the strained eggs into the lemon mixture, stirring regularly, for about 10 minutes, until it is thick and custard-like. It should feel heavy on the whisk. Remove from the heat and stir occasionally as it cools. Pour into warmed clean jar/s and seal. Strain eggs through sieve into heatproof pudding bowl and stir in the sugar. Add lemon juice, rind and butter. Tie on a double layer of greaseproof paper. Put ½ pint of water and rack in the pressure cooker and stand container on the rack. Cook for 15 minutes once it comes to pressure. Reduce pressure at room temperature. Stir lemon curd until smooth and pour into warmed jar or jars and seal. Cover the bowl and Microwave at one minute intervals stirring each time until the curd is fairly thick and glossy.This sets more on cooling so don’t be alarmed. * I like to make lemon curd in small quantities at any one time, and once cooled, it will keep for a couple of weeks in the refrigerator. ** The warmer the lemons, the more juice they will give. I leave my fruit in the warmth of the kitchen before I squeeze them.